This article was published on 04/06/2014. You're probably tired of lists by now, right? Well, here's another list to get your mind off all those lists you've been reading on the Internet. Someday, I'll make a list of the top ten best lists ever made. For now, though, I'll be listing my favorite classic controllers. There are a few things to remember when reading this list. First of all, I'm not you. It goes without saying, but everyone has different hands. Not all hands are created equal. For instance, some hands don't have thumbs, and some hands have extra thumbs. My hands are medium sized, with lots of long, bony fingers. Different controllers work best for different people and in no way am I purporting the controllers on this list to be the best for everyone. The controllers on this list are merely what work best for me. With that out of the way, it's now time for me to list stuff. 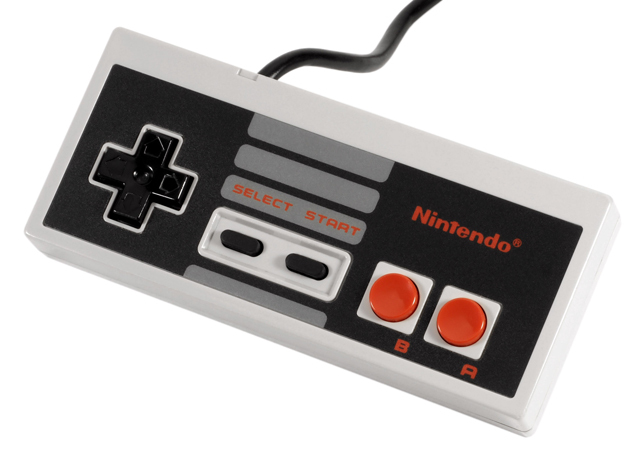 The NES controller is a classic, but it has aged poorly. What the NES controller does right is the d-pad and buttons; the d-pad is precise and easy to hit diagonals on, and the buttons are all solid. The controller also has a cool iconic design to it. At least, I think the design looks cool. That's sort of where the good ends and the bad begins, though. The primary issue with the NES controller is its boxy design. This was the standard in the 80s, but it's not hard to see why this type of design quickly faded into obscurity. It's just uncomfortable to hold a rectangle horizontally in your hands for extended periods of time. On top of that, the NES pad is a bit on the small side. It was clearly meant for the hands of children, making this controller a little hard to use if you aren't a child. I guess it can work if you have small, child-like hands, but even then, the boxy design is likely to cause some issues in the comfort department. The NES controller did get a redesign later on, referred to as the "dogbone" controller, that rounded things out a bit to make it more like an SNES pad. This redesign is far more comfortable and should be used over the original whenever possible. That didn't come until later, though, and I'm only going by the original controller designs for this list. The NES pad was one of the best controllers in the 80s, but was easily superseded by everything that came after it. Genesis controllers were a good step up from the NES pad. It's a bit bigger, the shape is more comfortable, hitting diagonals on the d-pad is very easy, and it even has an extra button! Make that a ton of new buttons, if you're counting the six button variant. I'll be focusing on the three button version, though, because it's the one I have the most experience with. Some tout the Genesis controller as the best controller ever made, but I'll have to disagree on that one, especially if we're talking about the three button version. It is a nice, comfortable controller, but I have a couple of problems with it. The Genesis controller's greatest strength is also its biggest downfall: it's a little too easy to hit diagonals on the d-pad, to the point where I find myself accidentally hitting diagonals all the time. This is great for isometric games like Sonic 3D Blast, but bad for any game that requires more precise input. Additionally, I find the button layout on this controller kind of strange. It's got three buttons all in a row, as opposed to the cross shape that many future controllers use. Typically, I have my thumb set near two buttons, like A and B, or B and C, but it's kind of hard for me to go from A to C. If a Genesis game takes the nonsensical route and puts the two primary actions on A and C, with C being jump, then that would be rather inconvenient. 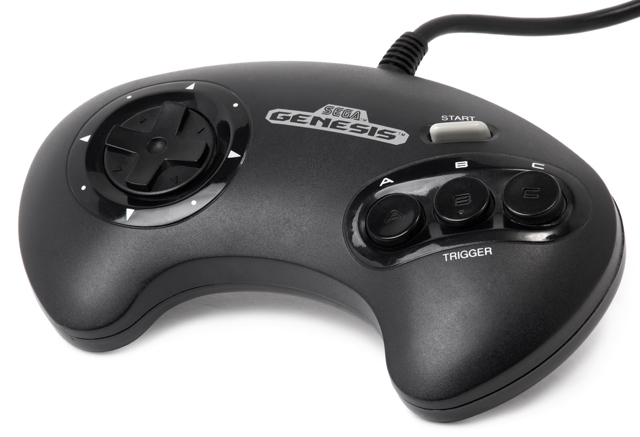 The Sega Genesis controller is a decent pad that I have a lot of nostalgia for, but it's far from ideal. 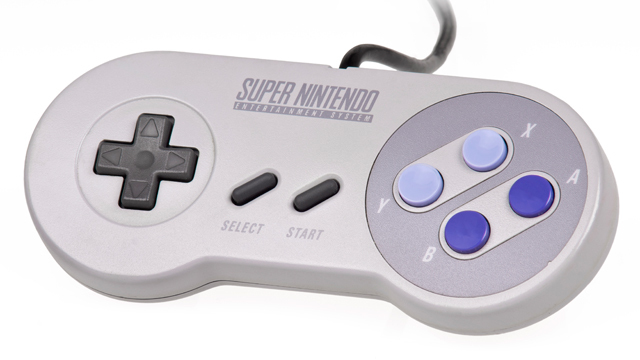 Without a shadow of a doubt, the Super Nintendo controller's design is the one most ingrained into my psyche. Whenever a game prompts me to hit the A button, my thumb instinctively moves towards the position of the A button on an SNES controller, which is bad when I'm playing on an Xbox 360 pad. It's also one of the most influential controllers, but this is something that could be said about many of Nintendo's other controllers. The d-pad is excellent both at precise input and at doing diagonals, the cross shape of the four primary buttons makes it very easy for my thumb to hit any of them at a moment's notice, and this is one of the first controllers to feature shoulder buttons. Its rounded shape also solves the comfort issues that the NES pad had. As much as I adore the SNES controller, it isn't perfect. While bigger than the NES controller, the SNES pad is still on the small side. It also doesn't have any prongs to hold on to, which makes me feel like a lot of my fingers are just dangling about. Not to mention that this controller has no 3D functionality whatsoever, as d-pads are ill equipped to deal with 3D worlds. That last one isn't a problem on an actual SNES, but can be a problem if you decide to use the SNES pad on the computer. It doesn't have any rumble functionality, either, though that hardly matters. I'll always have a soft spot for the SNES controller, but it's not my favorite. 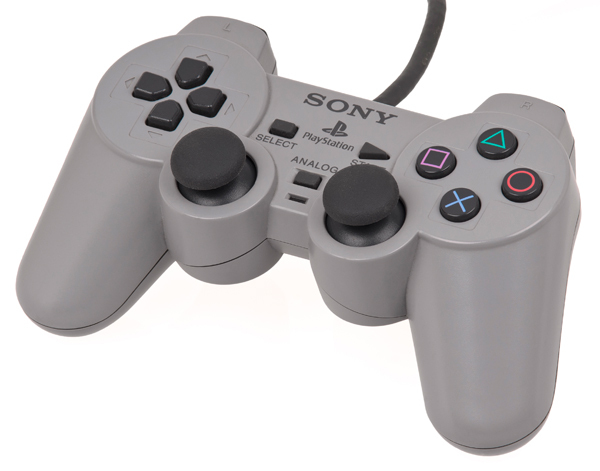 My favorite controller of all time is the PlayStation's DualShock controller. The PS2's DualShock 2 works, too. Wow, that last sentence sure had a lot of twos in it. Sony has been more or less using the same controller design ever since the first DualShock, with very small, incremental changes made to it over time. The most drastic change thus far has been the PS4 controller, but even that one is pretty similar to the original DualShock. The thing I love about the DualShock is its versatility. It has a fantastic d-pad for 2D gaming, two decent analog sticks for 3D gaming, great face buttons, four responsive shoulder buttons, and a two prong design that makes it comfortable to hold. I have a DualShock permanently hooked up to my computer for all of my gaming needs. When it comes to emulation, the DualShock passes with flying colors for almost every console ever made. The one exception is the Nintendo 64, and that's only because the N64 pad is too weird to be easily mapped onto any other controller. I will concede that the DualShock has some faults, though. The analog sticks aren't exactly the best, both in placement and in quality. However, I find that to be a minor problem. For the most part, I have no issues using the DualShock's analog sticks, even if they aren't perfect. It's a small price to pay for superb comfort and unparalleled versatility. So those are my favorite classic controllers. Now I'm going to briefly talk about the ones that didn't make it onto this list. At no point did I ever consider the N64 controller to be on here. It's a freak of nature and is only good at playing N64 games. However, it does have a really good analog stick, provided you aren't using one that's worn down. I briefly considered putting the GameCube controller on this list, but I felt like that might be too modern. Also, I never liked the X and Y buttons on it. I always get them muddled up. Don't even get me started on the uncomfortable triggers that make infernal racket whenever they're pressed. The Xbox 360 controller is probably the most popular one as of this moment, but that's not old enough to be a classic, so I didn't include it here. 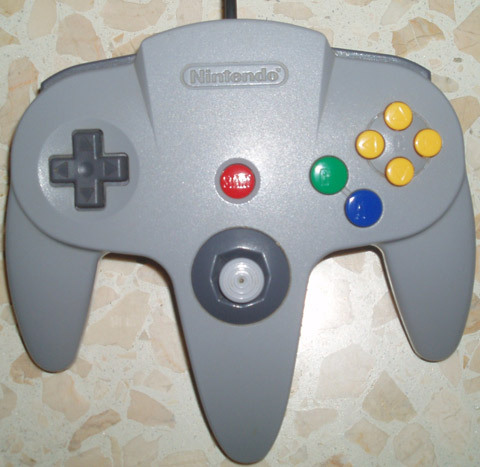 I also abhor the d-pad on that thing. The 360 d-pad can go die in a fire. That covers everything, I believe. I hope you enjoyed my article. 1,388,076 people love this site.